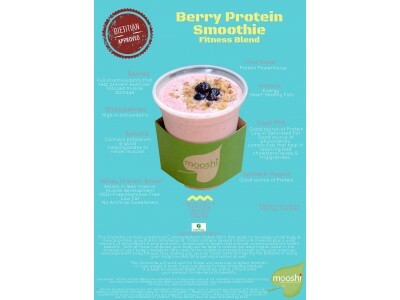 Post-Workout Recovery Smoothie to replenish lost nutrients & rebuild muscles. Workout, without proper replenishment, may slow you down on your weight goals. Mooshi Fitness Blends are formulated to augment your workout by assisting in the growth &/or maintenance of your muscles, hasten a faster recovery, as well as help you in your weight & health management journey. Make that workout count! It is best to consume these Smoothies within 2 hours after your workout to maximize its benefits. *Mooshi boosted products are not intended to diagnose, treat, cure or prevent any disease, but rather are dietary supplements intended solely for nutritional support. Please consult your Physician before starting any supplemental program, especially if you are pregnant, nursing or have a medical condition. These products are not recommended for children. Fitness Blends have not been evaluated by BFAD. This Smoothie contains a balanced Carbohydrate to Protein Ratio that leads to increased whole body & muscle protein growth &/or maintenance. It also contains several vitamins & minerals plus a wide network of antioxidants & phytonutrients, compounds in food/s that provide numerous positive health benefits. With all these combined, your body will be able to restore lost electrolytes, assist in the increase of your body's metabolic rate, reduce the oxidative stresses brought on by your exercise, reduce/prevent body fatigue, thus making you recover faster while still having the benefits of losing your body's excess fat & gaining muscles as well. This Smoothie will work well for those who exercise to either maintain or lose weight & even if you just desire to have a healthy lifestyle. Disclaimer: Mooshi Fitness Blends are intended for fitness exercisers & not intended to replace post-training recovery meals for athletes as the latter would require a highly individualized measurement. For more info, visit www.dietwisecebu.com.